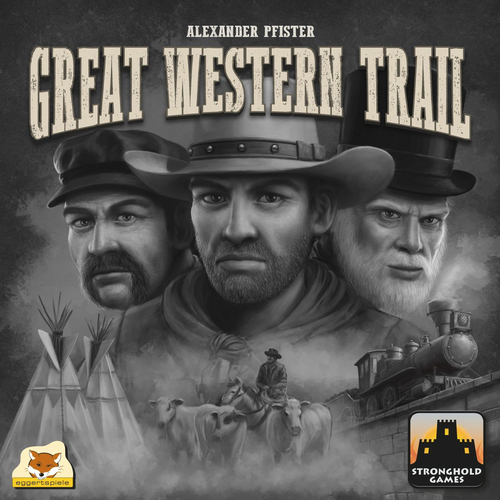 Great Western Trail capitalizes on the romance of the American west, but if you are looking for fighting and shoot outs – keep looking, if you are happy to reimagine the west as an outstanding strategy game with cowboys, cattle and trains this game could be for you. Brought to us by Alexander Pfister, award winning designer of Mombasa, Isle of Skye, and Broom Service, GWT is one of the hottest new games from Essen 2016. In short, the game is a true Euro, it incorporates several mechanisms and as a whole makes an interesting and challenging game. A brief summary of the game play is a bit hard to do. Since the rules are easily found eslewhere this is a general summary. Each player must manage their cattleman, their train and their hand of cattle. Players have individual player boards where the can hire cowboys to help with cattle, craftsmen to build and engineers for their train. Player boards also give benefits like supplemental actions. Players move their cattlemen across the board, stopping along the way at buildings either neutral ones seeded at the beginning of the game or buildings built by players during the game. Buildings give players special actions such as to help manage their hand of cattle, move their train, hire more workers etc. When the cattlemen arrive at Kansas City they sell cattle. Cattle are represented by cards, they have values and suites. You build a deck of cattle by buying and adding more cows during the game. Cattlemen may sell cattle in their hand and gain money equal to the value of each different cow. Money is used for hiring, gaining more cattle and to build stations for your train. Players receive an objective card at the beginning of the game and can obtain more during the game. Objective cards are sources of points but could also potentially lead to negative points if uncompleted. There are multiple ways to gain VP, from objective cards, cattle cards, buildings, train stations, to name a few. The player with the most VP wins. Downsides, the game has a lot of actions and it can take a while to explain, fortunately the game play is not complicated. There may be some potential for AP. The theme may feel pasted on to some. There is some indirect interaction as you can place hazards and buildings to try and slow your opponents. Also there is competition for station masters along the train track. What I like about GWT is that it meshes the mechanisms together quite nicely. I’m not a fan of deck builders per se but here as a sum of the whole it works. The planning needed as you move your cattleman is interesting but not overwhelming. Moving your train and the possible negative points that may generated especially at the beginning of the game are challenging. The variety of ways to earn points doesn’t feel like point salad as most are interrelated. I also like that your starting position can be the same or different from your opponents. GWT is a good middleweight game that will see several plays. 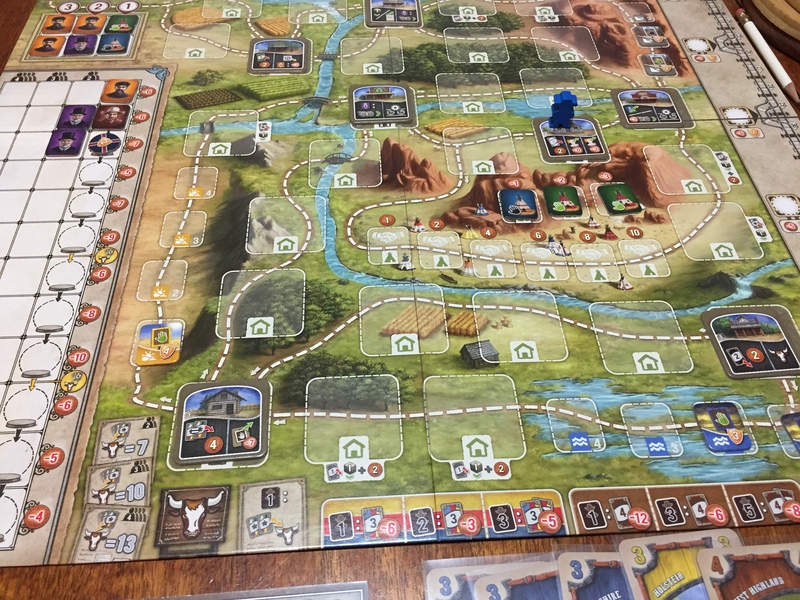 Nathan Beeler: While Great Western Trail had some interesting elements, on the whole felt as long and repetitive as a real cattle drive probably would. With all the other games in the world, most of them at the convention where I tried GWT, I decided to mosey on down the road to seek something better. Andrea “Liga” Ligabue (1 play): it is just a first impression but I really loved this game. It looks like offering so many possibilities and I really like the deck-building of the cattle’s deck. It offered me the same sensations of Mombasa, one of the best game last year. What I like most is the wide range of choices that seems to offers different path to victory. Dan Blum (1 play): I thought it generally worked but seemed overstuffed with little mechanisms; each one can provide additional decision points but, while having decisions in a game is good, adding more little decisions does not necessarily make a game better. I am also concerned that the game can be affected by a skewed setup. Since cowboys make the better cows cheaper and make it possible to buy the best ones, and your income comes from the cows, there seems to be a definite rich-get-richer problem if there are few cowboys available early. In our game there was just one cowboy available early, and the player who got that won easily; admittedly she was the only one who had played before, but the income disparity was definitely there and I think would have been an issue regardless. Craig Massey (1play): I’m not sure how I feel about the game just yet. My initial reaction after the first playing was similar to Dan’s. There are many mechanisms that are woven together that make for interesting decisions, maybe too many. I felt as if many of the decisions are red herrings. I suppose it will take many plays to confirm my suspicions, but ultimately it feels like you just need to buy more and better cows are you are going to fall behind and won’t be able to catch up. The rest of the game is just window dressing. Doug Garrett (2 plays): GWT is the hit of Essen for me so far. Straightforward actions and clear iconography speed up play once they are understood, and the choices as you proceed through the rondel-esque pathways are interesting and quick to do. I STRONGLY recommend playing this as a 2-player for your first play, rather than with a full contingent of 4 players, as the game can drag painfully with that many newbies. Shelley and I reviewed it in Episode 543. I love it! Andrea “Liga” Ligabue, Doug G.
+1 on Doug’s comment of avoiding playing 1st game with 4. I made that mistake, and it was too long. On second game, the game pace picked up dramatically, and my enjoyment did as well. Great game. I have played the game 3 times now; 4 if I count the first play which we had to abort due to someone needing to leave. So, yes I really like the game. There is more than one way to win. Getting cowboys is important, but not necessary to have at the very first. The layout can change the game play quite a bit if you mix up the building cards. The fun part is seeing how your meta strategies work out to maximize your victory points. Instead of a point salad game I would say Great Western Trail is a visit to the salad bar; lots to choose from, but you can be picky. Three games in – I love the game. I’ve played with 2 and with 4; loved it both ways, as did everyone who played it. The variable set-up adds variety, and the varying strategies make this a game you can continue to explore. I’ve seen the game won with NO cowboys and only 3 cattle buys! I’ve seen it won with a rush to get workers, and with complete neglect of workers! I’ve seen a train strategy win and lose. Of course, all of us are newbies at this point, so which strategy wins at this point might be a moot point because the other players don’t yet know how to exploit or expose a particular strategy. But in our experience, once we played GWT, we kind of forgot Terraforming Mars AND Scythe! 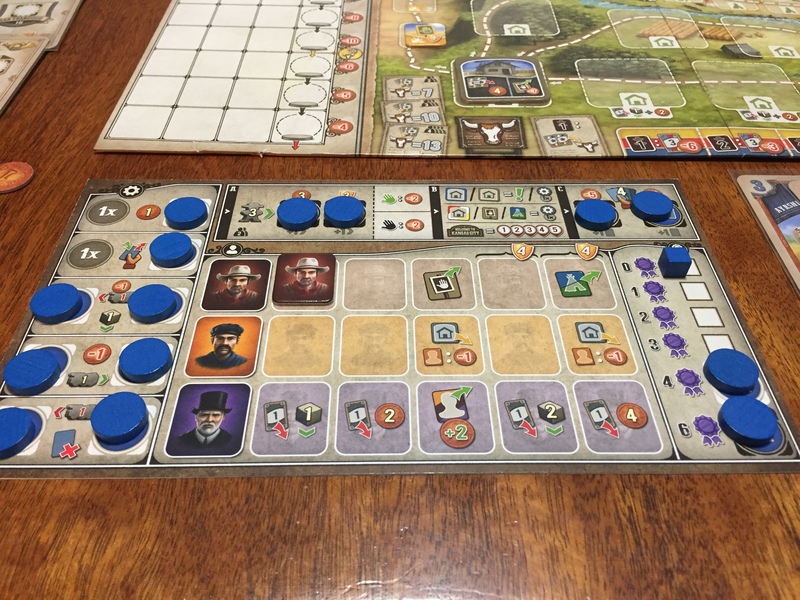 The GWT theme and mix of strategies, and the tension of a race to key spots (Station Master’s with the best payouts; buildings in the best positions; getting the 5 value cattle; getting the right objective card before others, etc. keep the tension high and interesting throughout. Best of the Essen releases for me at this point, but still have a few more to try. I played this for the first time earlier this week, so I didn’t get the chance to add to the comments. My first game was a really enjoyable one. I don’t know of another game that really feels like this, which is a big plus in my book. I really like the way the different paths on the way to Kansas City can change throughout the game as players construct buildings. There’s lots going on, but turns are actually quite quick. I am a bit concerned about game length; the 4-player game may prove to be too long, which would be disappointing, since I feel the same way about another Essen favorite, A Feast for Odin. I can provide another data point to support the comments about the necessity of buying cattle, as I only bought 2 and still won. There really seems to be many potential paths to victory–we had three completely different approaches in our 3 player game and each seemed worthwhile. The wealth of options with GWT is remarkable; while it’s a more focused game than Odin (no central board with 60 actions! ), the game space feels just as big. Obviously, these feelings will be refined as we explore the game some more. It’s always hard to say after just one game, but I suspect (and hope) this will turn out to be an “I Love It!” game once I get enough plays in. It’s currently a leading candidate for my Game of the Year for 2016 and I can’t wait to get it to the table again! My one play left me rather disappointed. I tend to agree with Nathan and Dan’s opinions. The game takes a LONG time to develop and felt like it plodded along like I perceive a real cattle drive would be. Yes, there were interesting elements and clever ideas, but the experience just felt slooooow. I’m certainly going to try it again, but I don’t see it ever being a hit for me.